The AED pads are attached and the first aider continues giving CPR until the AED tells him or her to keep clear. 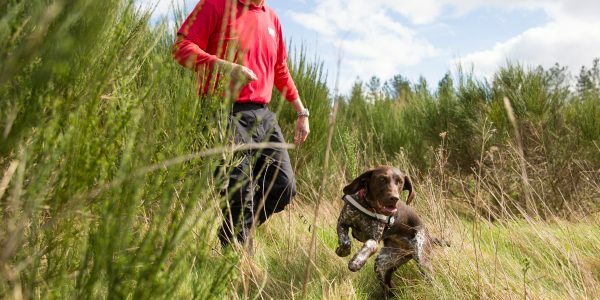 On the second Wednesday of each month there is a full team training session on an aspect of SAR. 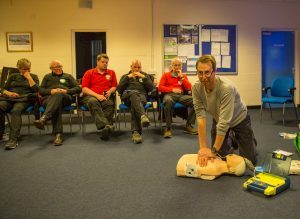 April’s session revised first aid training with an emphasis on use of an AED (automated external defibrillator) and helping a person who is choking. Automated defibrillators are designed so that they can be safely used by members of the public, and are to be used in conjunction with CPR. The defibrillator talks the first-aider through the necessary steps including if and when to apply a charge. Jim demonstrating how to help a person who is choking. 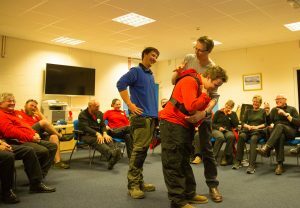 To demonstrate and practise the application of 5 back blows and 5 abdominal thrusts, a volunteer wore protective pads on his back and abdomen. The abdominal pad included a model windpipe with blockage. A correct abdominal thrust was rewarded with the blockage being propelled from the windpipe.